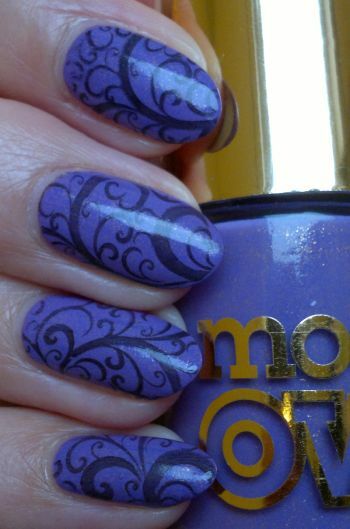 For this mani I painted my nails with Models Own Diamond Luxe Pear Purple (2 coats). This is a beautiful polish. It’s purple (which my favourite nail colour), and it’s bursting with micro-shimmer. I love it! Whilst the plain purple nails looked great on their own, I decided to stamp. I used Pueen‘s 74 plate (which is part of Pueen‘s Buffet Leisure stamping plate collection).